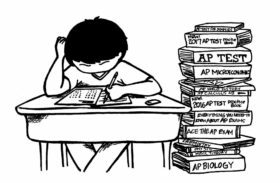 If you are interested in taking an AP exam, click here to register. Tomorrow, March 22nd, is the last day to register. There are no exceptions. Once you have submitted your exam(s) order, visit the student store during nutrition or lunch to pay $5 per exam. To pay during the school day, ask for a pass from your teacher so you can pay during class time. Note: You do not need to be in an AP class to be able to take an AP exam.